In the southeast of Venezuela, there is a lost world that transfers the tourists to amazement if he sifts the table mountains in the distance. How islands, they stand out with their vertical walls into the green plains. Geologists have estimated the origin of the quartz sandstone tepuis about 1.8 billion years ago, the division of the twin tepuis Roraima and Kukenen took place 160 million years ago, when South America separated from Africa. The table mountain Roraima lies exactly in the border triangle of Venezuela, Brazil and British Guyana and is with 2723 m the highest of 115 table mountains in the Gran Sabana. 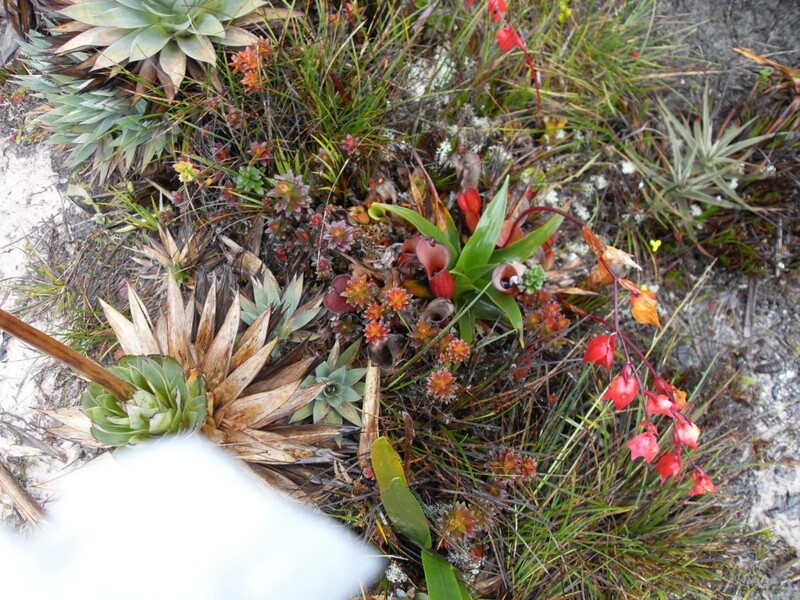 Approximately 75% of existing animal and plant species on the Mount Roraima are endemic, that means they are found nowhere else on Earth. The 6-day trekking tour into the “Lost World” is an unforgettable experience and without a doubt one of the highlights in Venezuela. Who has a good condition and like hiking should not miss this adventure. 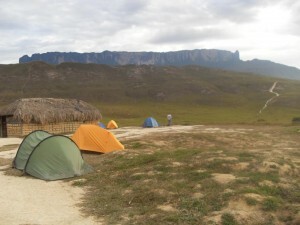 The tour starts in the morning in Santa Elena de Uairén (870 m above sea level), about 15 km from the Brazilian border. In 1 ½ hours of driving going with all-wheel vehicles first on an asphalt road, then on a gravel track through the Gran Sabana to the remote Indian village Paraitepui where the walk begins. 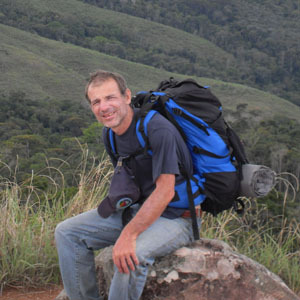 Now it goes 13 km (3-4 hours) through the beautiful slightly undulating savannah landscape with views of numerous table mountains towards Mount Roraima, which is getting closer. Overnight in tents at Rio Tek, where you can still treat yourself to a refreshing swim before dinner and enjoying the magnificent views. After a vigorous breakfast we go today in 5-6 hours, 11 km, further on to the Base Camp. Right at the beginning you have to cross the small rivers Tek and Kukenan , and depending on the water level, the crossing of the Rio Kukenan can be adventurous. 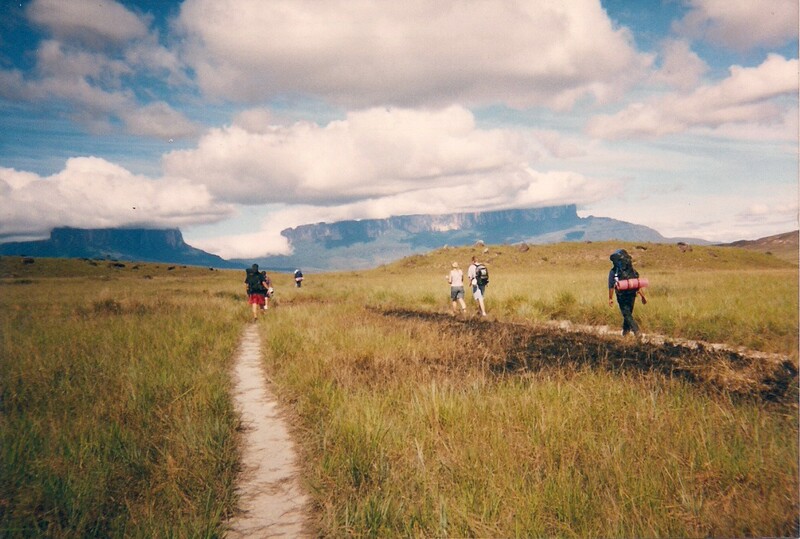 On this day it goes steadily uphill, always the Mount Roraima in front and on the left side at Tepui Kukenan a 600 m high waterfall in sight. 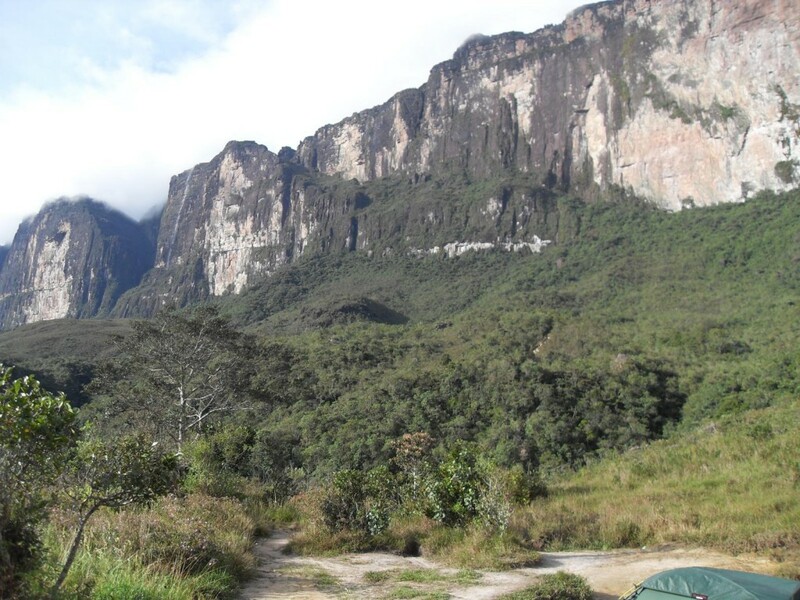 We spend the night at the foot of the table mountain in the base camp with a view of the ramp of Mount Roraima. 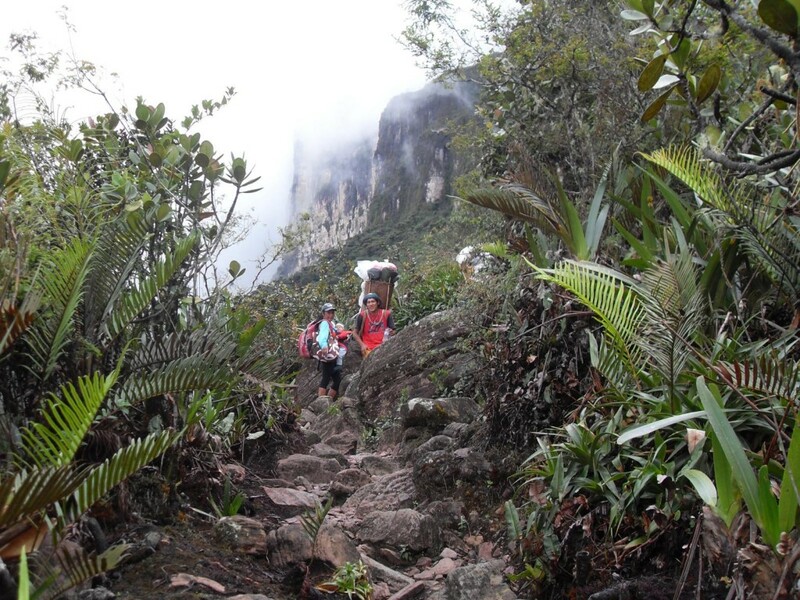 Today, the exhausting but also beautiful ascent to the summit of Mount Roraima is imminent. In about 4 to 5 hours, the 4.5 km and an altitude of 900 meters has to be covered and the rise is truly an experience in itself. Due to the constantly changing vegetation and the many lookouts points you almost forget how hard the path is upwardly. After about 2 hours you get to the towering wall of the Mount Roraima and now it’s adventurously always along the wall above the ramp to the top. Around noon you reach the plateau and now it goes to a so-called hotel, a ledge or a small cave where the camp for the next two nights will be set up. Depending on weather conditions after lunch you go out to a little exploration trip to admire the truly unique landscape. 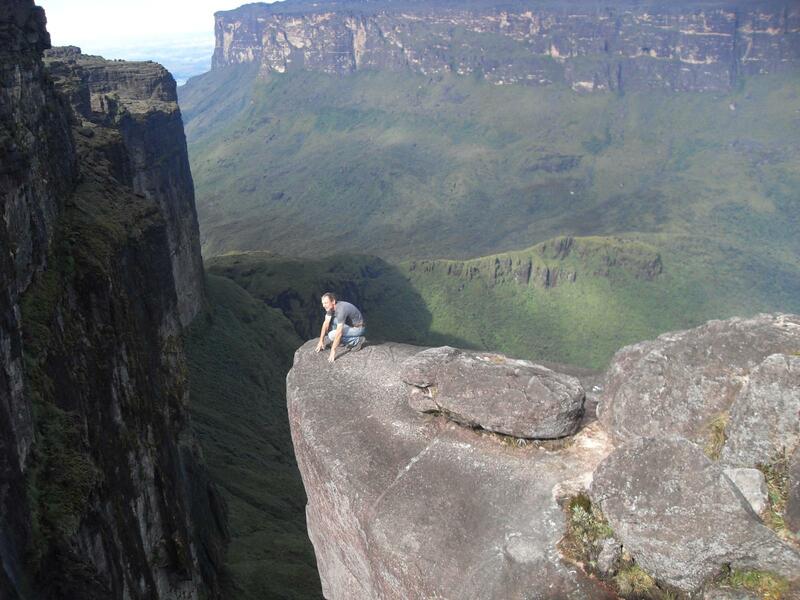 The whole day is available for exploring the Mount Roraima. Whether it is the numerous stone sculptures, crystals, the unique plants and animals, or the border point to Brazil and British Guyana, one day is actually not enough to enjoy all sites. Just some different viewpoints such as “La Ventana” (window) to the neighboring table mountain Kukenan invite you to stay and the time flies by. Now stands before the descent to base camp, where usually lunch is taken. Then it goes on the same way back to the camp Rio Tek, where the last day is spent and where you can enjoy all the scenery again. Now you walk back through the unique landscape to the Indian village Paraitepui. After lunch we drive back to Santa Elena de Uairén.